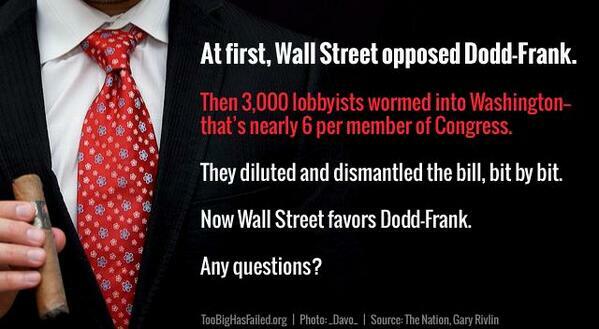 The first reason would be if Dodd-Frank perpetuates the so-called TBTF subsidy. This is the idea that being designated too big to fail creates an implicit government guarantee for creditors that permits large banks to access capital markets more cheaply than non-TBTF banks. Whether there is a continued subsidy, and if so, how large, seems to be still somewhat undetermined at this point. The second, and the one that prompts this post, is the regulatory tax imposed by Dodd-Frank and other new regulations. It has long been recognized that there are certain types of regulations for which the costs are somewhat invariant to size. Such regulations fall proportionally more heavily on small firms in an industry than large firms. Small banks claim that this is the case with much of Dodd-Frank–and unlike the TBTF subsidy, this assertion seems largely uncontested to me. Here’s an article reporting on recent comments by Fed Governor Jerome Powell acknowledging that point. Many bankers in charge of small banks say the deck is stacked against them. Regulation is a common adversary; small banks say they feel the costs of compliance with banking regulations more keenly than giant banks with well-funded staff. John Buhrmaster, President of First National Bank in Scotia, NY says that it’s surprising that any really small banks actually make it. First National Bank in Scotia, NY is in its 90th year with 10 branches and $400m in assets. To be sure, it could be argued that the American banking system historically was over-fragmented. But “right-sizing” the industry should be the result of economic competition, not disproportionate regulatory burdens. It would be an ironic legacy of Dodd-Frank if it promoted consolidation of the biggest banks that made the mess in the first place–yet that’s where I predict we are headed. « If Fama were Newton, would Shiller be Einstein?